Today, cars are more customizable than ever. There are options for colors, interiors, features, screens, seats, almost everything. One thing that the modern consumer doesn’t always consider is the fact that even your brakes are customizable. There are two systems, brake pads, and brake shoes. But which one you want depends completely on how you drive and what you do with your cars. While typical quotes for brake replacement include the labor, it is important to know how much the parts are costing you. For brake pads with a range of different materials, you wind up with a range of cost that you can wind up paying. The lower end materials (the semi-metallic) could cost as little as $50 per axle, but the higher end ceramics could cost as much as $150 per axle with organics somewhere in the middle. These costs will fluctuate with the places that you go. There could also be an increase in cost when you’re going to a mechanic because they’re ordering the parts for you. But when you add on the cost of labor for brake pads alone, then replacing an axel’s worth of brake pads can cost $150 to $250 dollars. But that cost will depend on the kind of brake pad you want and what you’re willing to pay at the moment. If you have the skill and ability to change the brake pads yourself, you can cut your costs way down. With the fact that brake shoes are older systems and easier to manufacture, you can expect to pay a little less for replacing these parts than you would for the brake pads. However, just as with the brake pads, there is a range of costs since there is more than one material that you can use for your car. Some places may charge only $100 for both the materials and the labor required to deal with brake shoes, but you could easily wind up paying up $300 if you want better materials and are having a mechanic doing the replacement for you. As with replacing brake pads, if you can do the physical labor yourself, then you can cut costs way down by just paying for the parts. However, the time that you dedicate to this work is also a cost to consider. Brake pads are the most common system for breaking. It uses a disc and two pads to create friction that will slow your car down. This is created by the two pads being pressed against a spinning desk. This system works well because it doesn’t generate a ton of heat. This is used on the front axle of the car, but can also be applied to the back of the car. These brakes cost a little more but are also more efficient and long lasting. Brake shoes are an older system but are still used typically on the back axle of a car. Instead of squeezing something like the disc in the brake pad system, the brake shoe pushes outward against a brake drum and causes friction that way. This system generates a lot more heat than the brake pad system, but the cost of replacing these pieces is much lower. The lower cost is because of the fact that brake shoes are older and easier to manufacture. 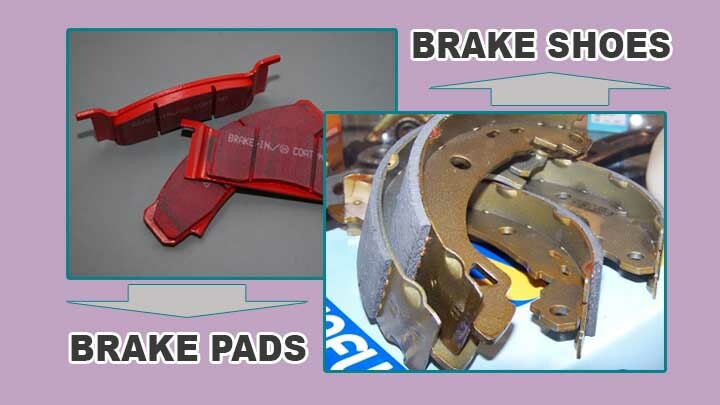 Brake pads can be made of several different materials. Each material offers its own benefits and pitfalls. The cheapest and most common material is semi-metallic. It is called semi-metallic because while there are metal shavings in the pad, it is held together with resin. This material is heavy, impacting the gas mileage of the car. This material will also cause the most wear and tear on the rotors of the car. The most quickly worn out brake pads are ones made from organic materials. This might appeal to people that want to be a little more environmentally friendly, but these pads will wear down extremely quickly and will also release dust when braking. These pads are also the quietest which might appeal to some people. The most expensive material on the market is ceramic. These brake pads are lightweight and durable, but the cost is more than any of the others, which can make these the least appealing option for some people. Really, which material you opt for will be because of what you can afford and maybe even at the suggestion of a professional. But know that you have even more options when it comes to your brake pads. Because brake shoes are an older system, they have used a number of different linings to press against the drum. Before the adverse effects of asbestos were discovered, asbestos was the most commonly used material in the brake shoe. Nowadays, brake shoes use a lining made of synthetic aramid. Aramid is used in several different things but is a common replacement for anything that used asbestos before. This isn’t the only material used, but because of its heat-resistance, the synthetic fibers are often one of the favorites. Which material you decide to use will probably be from what is available or suggested by the mechanic that is working on your car. Knowing just how your car’s brakes work can help you save money and time when you need to replace them. If you don’t do a lot of driving with your car, having brake shoes might be the least expensive choice. However, the brake pads are the most efficient system of the two. In fact, most modern cars are produced with brake pads on at least the front axle. So even if you don’t have a choice in which system your car uses, you can at least use your knowledge to cut costs when maintaining your car. You have more choices than you expect when it comes to your car. Great informative article. Thans. IMHO, brake pads – and rotors and calipers – are SO much faster and easier to replace DIY than brake shoes (stuck drums and SPRINGS!) that it’s worth the cost to get disc brakes all around.